This was truly a genealogy adventure. I’d written most of this post before I made two surprising discoveries that required me to rewrite substantial parts of it. 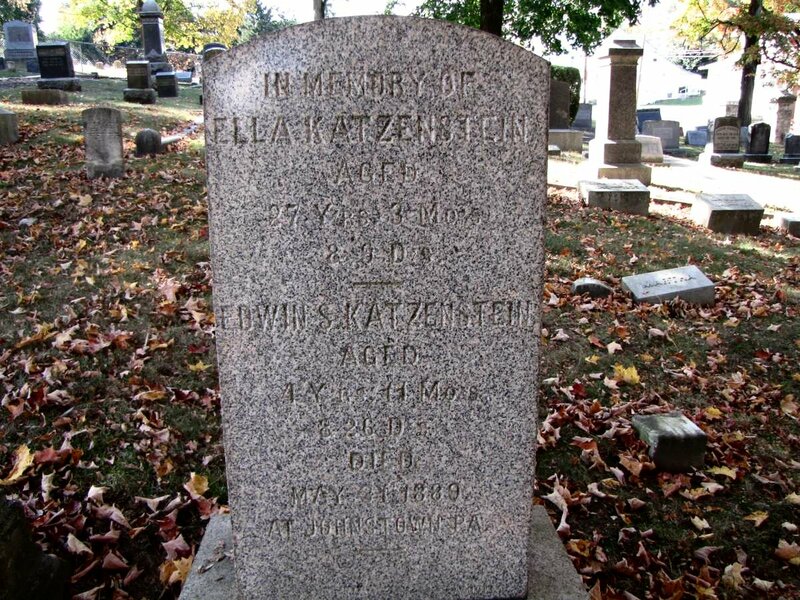 The story of Jacob Katzenstein’s first wife Ella is heartbreaking. She was only 27 when she died in the 1889 Johnstown flood, and for a long time I knew almost nothing about her. I’ve finally made some headway in learning more about her. Here’s what I now know about her from various sources, more or less in the order I found them. 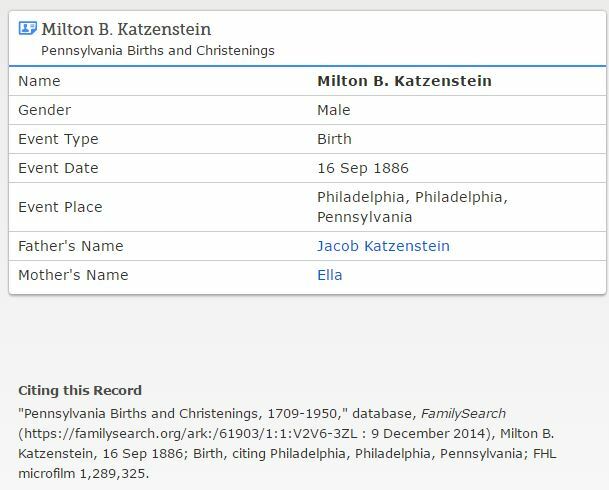 Her first name was Ella, as seen from the birth record indexed on FamilySearch for her son, Milton B. Katzenstein. Her birth surname was Bohm, as seen in a newspaper report of her death and as implicitly confirmed by the fact that Milton’s middle name was Bohm; that fact I learned from Milton’s burial record at Grandview Cemetery in Johnstown. I know that Ella was probably born in February 1862, as indicated on the memorial stone placed at Eastview Cemetery in Cumberland, Maryland. Her father’s name was apparently Marcus Bohm; that fact I inferred from the fact that Ella’s widower Jacob Katzenstein included Marcus in his household on the 1900 census and described him as his father-in-law (even though by that time Jacob had remarried). Ella presumably married Jacob sometime before or around January, 1886, since their son Milton was born in September, 1886. Milton died on April 18, 1889. I also know that a second child, Edwin, was born June 5, 1887, and that he and Ella were killed in the Johnstown flood on May 31, 1889. But where was Ella before marrying Jacob and having these two little boys? For the longest time, I could not find her on the 1870 census, no matter how many ways I tried to spell her name, with and without wildcards. And then somehow she popped up after I’d just about given up. I decided to search for any Ella with a surname starting with Bo born anywhere in about 1862 living in Pennsylvania or any state bordering it. And there she was, listed as Ella Bohn, living in Philadelphia, an eight year old child born in Pennsylvania. Her father was not living with her, nor was there anyone else in the household named Bohn or Bohm. So who was she living with? I took a deep breath when I saw. She was living with Jacob Goldsmith. Who was he? The son of Simon Goldschmidt and Fradchen Schoenthal. Simon Goldschmidt was the brother of my three-times great-grandfather Seligmann Goldschmidt, the father of Eva Goldschmidt Katzenstein, whose son Jacob would later marry Ella Bohm. And Fradchen Schoenthal was the sister of my three-times great-grandfather Levi Schoenthal, father of Isidore Schoenthal who would later marry Hilda Katzenstein, daughter of Eva Goldschmidt Katzenstein and brother of Jacob Katzenstein, who would later marry Ella Bohm. So little Ella Bohm was for some reason living with the first cousin, once removed, of her future husband Jacob Katzenstein. And with in-law relatives of her future sister-in-law, Hilda Katzenstein, my great-grandmother. And they were all related to me. Yikes. But where was her father? Why wasn’t Ella living with him? Why was she living with Jacob Goldsmith? Unfortunately, the 1870 census did not include information about the relationships among those in a household, so I couldn’t tell. A search for information about Ella’s father Marcus Bohm turned up nothing explicit connecting him to Ella, though I was able to piece together some information about Marcus. He was born November 9, 1834, in Warsaw, Poland, and immigrated to the United States in 1849, arriving in Baltimore. 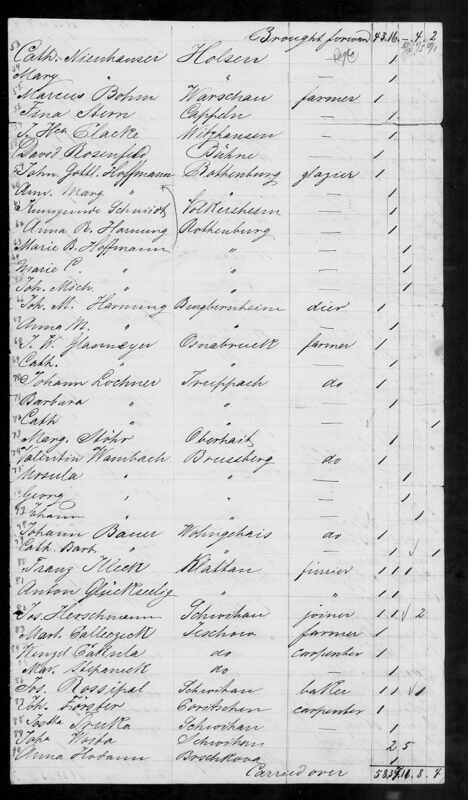 Maryland, Baltimore Passenger Lists, 1820-1948,” database with images, FamilySearch (https://familysearch.org/ark:/61903/3:1:3QS7-897J-P6W?cc=2018318&wc=MKZ4-GPF%3A1004777901%2C1004778901 : 25 September 2015), 1820-1891 (NARA M255, M596) > image 404 of 688; citing NARA microfilm publications M255, M596 and T844 (Washington, D.C.: National Archives and Records Administration, n.d.). 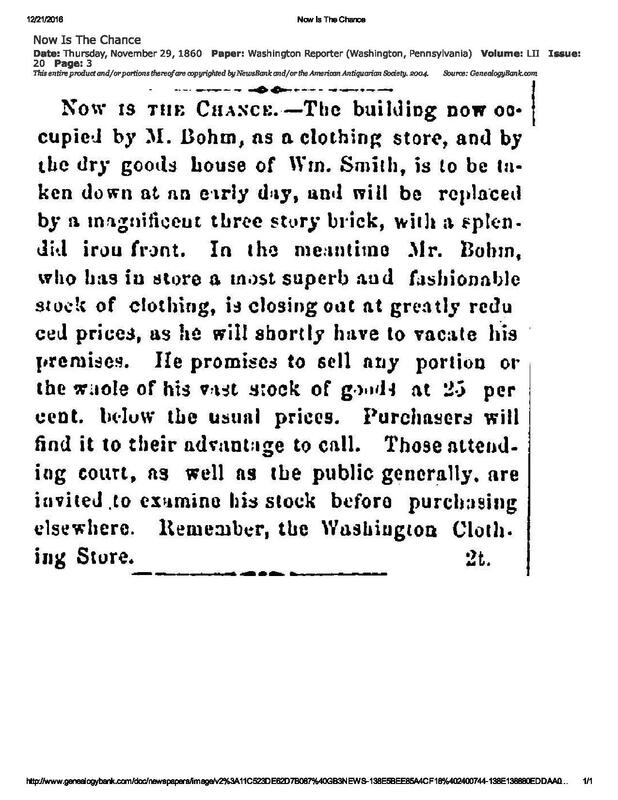 One document indicates that he was living in Washington, Pennsylvania, in 1853, which, of course, is where many members of my extended family also settled, including Jacob Goldsmith, who was a clothing merchant there as early as 1850, and Jacob Katzenstein’s brother SJ, who arrived around there in about 1871. It seems he then left Washington, Pennsylvania, because according to a New Jersey index of the 1860 census, Marcus was living in Hudson Township, New Jersey, in 1860, although I cannot find him on the actual 1860 census records. He is listed in the 1867 Trenton, New Jersey, directory as working in the clothing business and living at Madison House. On the 1870 census, he is listed as living in a hotel in Trenton and working as a clothier. There is no wife or child living with him. Jacob, Fanny, and their many children were living in Philadelphia, and living with them was a niece named Ella Baum, age 17. This had to be Ella Bohm, who would have been turning 18 in 1880. She was living with Jacob and Fanny Goldsmith because she was their niece! So her mother had to be either Fanny’s sister or Jacob’s sister. For reasons described below, I believe she was the daughter of Jacob’s sister Eva. Jacob had several sisters, but for all but one, I’d found married names, and they had not married Marcus Bohm. But there was one sister for whom I’d been unable to find anything more than her name on the passenger manifest with her father Simon and stepmother Fradchen in 1845 and her listing on the 1850 census with her father Simon and stepmother Fanny and several siblings. Her name was Eva Goldschmidt/Goldsmith. But Eva is not listed as living with Simon in 1860 when he and two of her younger half-siblings had moved to Washington, Pennsylvania, to live with her older brother Jacob. So where was she then? I don’t know, but here’s my theory. My guess is that Marcus Bohm and Eva Goldsmith, Jacob’s sister, were married sometime around 1860. After their daughter Ella Bohm was born in 1862, Eva either died in childbirth or sometime shortly thereafter and before 1870. Supporting the theory that Eva had died is the fact that her brother Jacob named a child born in 1871 Eva. I believe that Ella’s widowed father Marcus Bohm moved to New Jersey after losing his wife and his business in Washington, and he left his little daughter to be raised by her uncle, Jacob Goldsmith. That little girl then grew up and married Jacob Katzenstein, who was her second cousin. I don’t know when she married Jacob. I cannot find Jacob or Ella on the 1880 census, although Jacob was listed in the Pittsburgh directories for 1879 and 1881, the Johnstown directory in 1884, both the Philadelphia and Johnstown directories for 1887, and the Johnstown directory in 1889. When their son Milton was born in 1886, Jacob and Ella must have been living in Philadelphia. And by 1889 they were living in Johnstown. Where was Ella’s father Marcus in the 1880s? 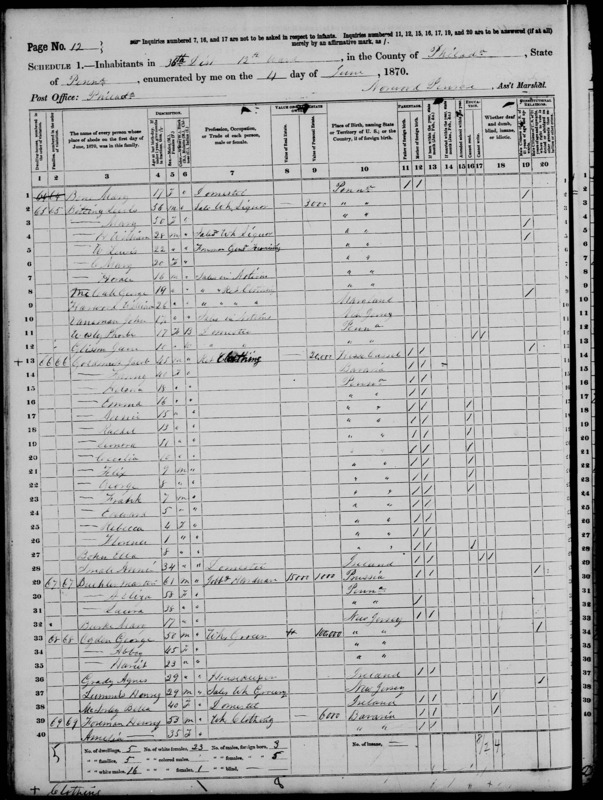 The 1880 census report shows that he was then living in Washington, Pennsylvania, boarding in a hotel there and working in a clothing store. But by 1884, Marcus had moved to Johnstown, as the 1884 Johnstown directory lists Marcus living at 251 Main Street and working at 272 Main Street in the clothing business. That same directory lists Jacob Katzenstein as a commercial traveler living at 241 Main Street, just a few houses away from Marcus. I assume that Marcus moved to Johnstown because his daughter Ella had by that time married Jacob and was living there, but I don’t know for sure. After the tragic deaths of his daughter Ella and his two grandsons Milton and Edwin in 1889, Marcus seemed to disappear for some years and does not appear in any city directories. 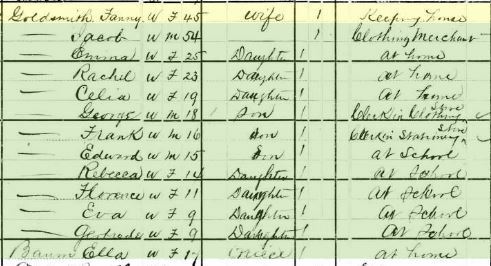 The next record that does include Ella’s father Marcus is the 1900 census where, as noted above, he was living in Johnstown with Jacob Katzenstein and Jacob’s second wife Bertha Miller, their three children, Bertha’s brother Maurice, and a servant. Marcus is described as Jacob’s father-in-law, widowed, and retired. I find it rather heartwarming that Bertha Miller took in the father of Jacob’s first wife. Ten years later Marcus was still living in Johnstown, boarding in the household of Solomon Reineman, according to the 1910 census. I thought perhaps Solomon was a relative or married to a relative, but Solomon was born in Germany, not Poland. In 1880, Solomon had been living in Johnstown, so I assume that Marcus had become friendly with him during the 1880s when both were living in Johnstown. And then I found a connection to Solomon’s wife, Minnie Leopold, though not directly. While researching Jacob’s second wife, Bertha Miller, I saw that her mother was named Eliza Leopold. The name jumped out at me, and I thought—could there be a connection to Minnie Leopold? A few more steps of research, and lo and behold, I learned that Eliza and Minnie Leopold were sisters! So somehow Marcus Bohm ended up living with his son-in-law’s second wife’s aunt and her husband. Two years later, however, Marcus had moved to Philadelphia. The 1912 Philadelphia directory lists Marcus Bohm living at 3333 North Broad Street. 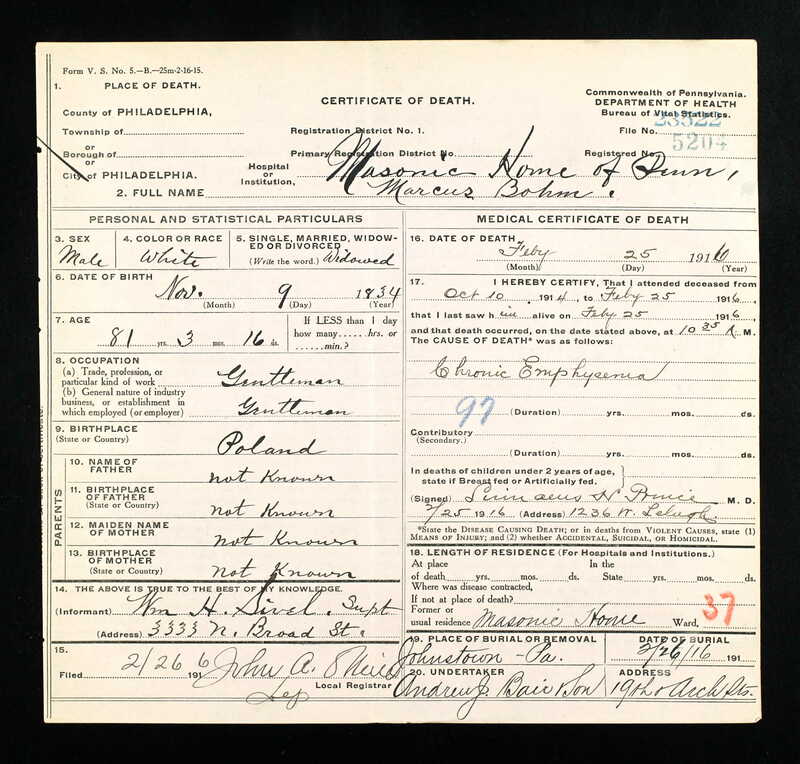 Four years later on February 25, 1916, Marcus died in Philadelphia. He was 81 years old and died of chronic emphysema. He’d been living at the Masonic Home of Pennsylvania, and the informant was William H. Sivel, the superintendent at 3333 North Broad Street, which I assume is the location of the Masonic Home and where Marcus had been residing. There is no other personal information on the certificate except for Marcus Bohm’s birth date, birth place (Poland), age, and occupation, which the informant described as “gentleman.” I was unable to find an obituary or any other document that would reveal family information for Marcus, only this death notice. Thus, I was lucky enough to learn a little more about Ella Bohm Katzenstein and can only speculate that her mother was Eva Goldsmith, that Eva Goldsmith Bohm had died, and that Ella had been left to live with the family of Jacob Goldsmith while her father tried to recover from losing his wife and his store in Washington, Pennsylvania. If I am right in this speculation, it makes her short life even more tragic. It was heartbreaking enough to know that she’d lost her first son Milton and then was killed along with her other son in the Johnstown flood of 1889 when she was only 27. But adding to that the loss of her mother and in some ways her father as a young child makes her story especially poignant. 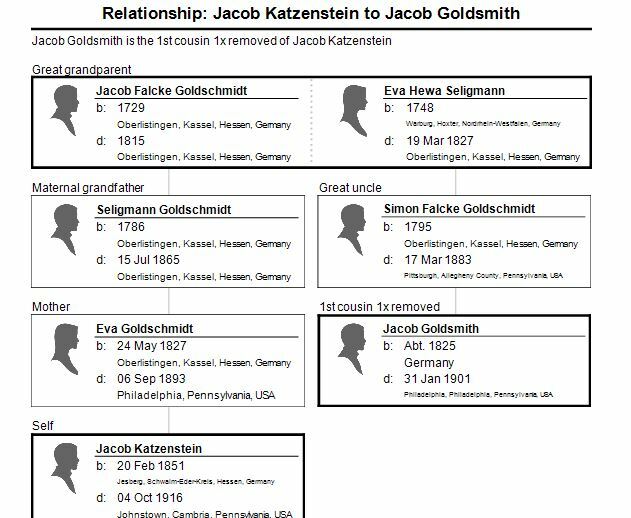 This entry was posted in Genealogy, Goldschmidt/Goldsmith, Katzenstein, Pennsylvania, Philadelphia, Pittsburgh, Schoenthal, Washington PA and tagged genealogy, Goldschmidt, Johnstown, Johnstown flood 1889, katzenstein, Pennsylvania, Philadelphia, schoenthal by Amy. Bookmark the permalink. Yes, that’s why I was so compelled to find her story. And I didn’t even realize she was a cousin (and not just by marriage) until I was almost at the end of my research. 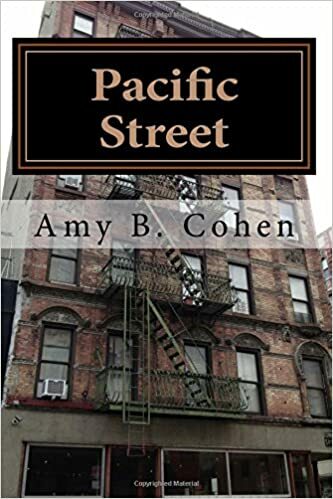 Outstanding read and research Amy. Such tragedy…and I am left thinking about Marcus and everything about his life that surrounded him in heartbreak, he was such a young man when he lost his wife, then the circumstances of his daughter….his grandchildren. I do love all the connections within your family…this journey of discovery is so fun and I love sharing in it with you. I somehow missed this comment, Sharon. Sorry about that. Thank you for your thoughts. Marcus remains somewhat of a mystery to me as he seems to have had no family (aside from his daughter and grandchildren) in the US. Also, he came from Warsaw…long before there were many Polish Jewish immigrants in the US. I’d like to know more, but I am so glad at least I was able to learn more about Ella! When you began with, “I took a deep breath….” and continued with the convoluted relationships, I also had to take a deep breath before I read it again. It’s difficult to follow all the twists and turns but you make it so worthwhile to read. A sad story but now it won’t be forgotten. Thanks, Cathy. I am always struggling to try and explain these relationships as clearly as possible, and I hope the charts help. But damn, my crazy family just had to keep marrying each other and tying me in knots! Heartbreaking. I’m so glad you have told her story. Thanks, Shirley. I am so glad I found it. This is such a sad story Amy; and as always your research is inspiring, and your storytelling quite spell-binding. Amy, I always enjoy how you unravel a twisted ball of genealogy yarn to smooth out the threads and then weave them back together 🙂 You are one of the best researchers I know. Plus a great story teller. Happy New Year! Thank you, Janice! That really means a lot coming from you!! I am so impressed that you can keep track of all the connections, names, and places! These are amazing tales! I’m so glad you were able to learn more about Ella. She sure had a difficult life. So am I! I can’t believe she ended up being my great-grandmother’s second cousin! Both these posts have been fascinating. Poor Ella–she had her share of bad luck! Interesting to see another Jewish Mason connection, too. Thanks, Luanne. These were both hard and satisfying to research, especially learning that Ella was not just married to my great-great-uncle but a cousin herself. What an amazing story in every way.